These graphs show the median round-trip times (RTTs) from the probing monitor to various countries (and US states). 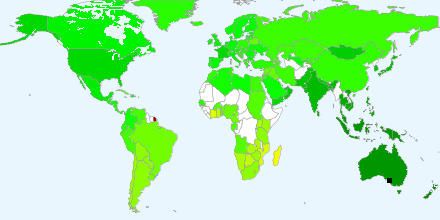 The country/state is obtained via NetAcuity for each hop's IP address. 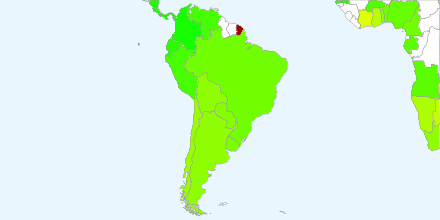 All RTTs to that country/state are collected and the median is calculated and assigned a color (with a maximum displayed value of 1000ms). The location of the monitor is indicated by a black box on the maps. 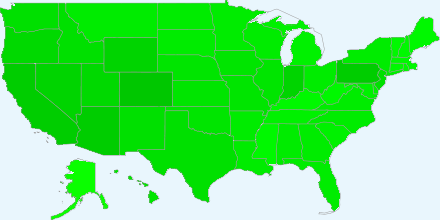 By looking at the country/state level differences in RTT, we can see how political boundaries can contribute to changes in packet transmission speed. In general, one will expect to have the lowest median RTTs in the country that hosts the Ark monitor, with RTTs increasing slowly with geographic distance. However, some countries will have significantly higher median RTTs, which indicates that the slower speed is due to infrastructural issues. If these only occur transiently, they point towards a misconfiguration or temporary failure instead of a systemically slower network.